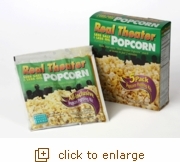 Try out our new Real Theater Popcorn LESS SALT/LESS OIL Pouches. Tastes so good you'll think you're at the movies! Now you can use the secret ingredients movie theaters have known about for years to make perfect movie theater popcorn at home! Everything you need is included (popcorn, seasoning, and oil). Just snip, pour, and pop. Made for stove-top popping in your pan or our Whirley Pop ™ Popcorn Popper (not for microwave use). Includes Gourmet Popcorn, our Secret Buttery Salt and our Special Popping Oil! You get 5 pouches of great movie theater popcorn. Twice as fast as microwave with a lot less fat. Perfect theater popcorn taste in every bite, now with Less Salt and Less Oil than our original Real Theater Popcorn Pouches. Each pouch makes 6 quarts of Less Salt, Less Oil Popcorn. Contains 5 Less Salt, Less Oil pouches. %Percent Daily Values are based on a 2000-calorie diet. Your daily values may be higher or lower, depending on your caloric needs.